Enrique Torres was part of the famous Torres Brothers (along with Alberto Torres & Ramon Torres)…. Enrique Torres was a major star in California and held the Los Angelas version of the World title in the 1950s..
1968: Enrique Torres retired from professional wrestling and settled in Calgary, Alberta, Canada..
September 10, 2007: Enrique Torress passed away at the age of 85 in Calgary, Alberta..
Special thank you to Ana Torres for showing this profile to her father-in-law, Enrique Torres, and helping with the information! 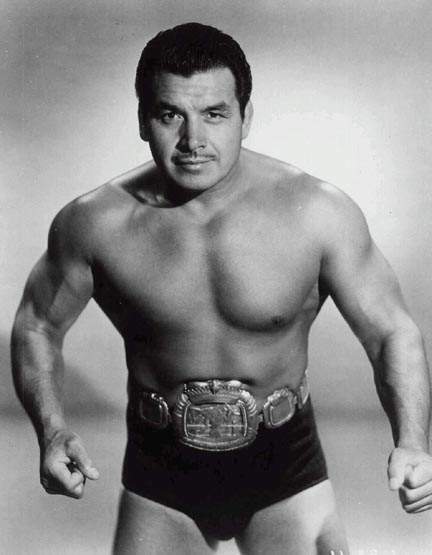 Dr. Mike Lano (global wrestling writer/photographer from 1966 to current) wrote: Enrique Torres was truly one of the all time ring greats, Hispanic or otherwise. The CAC will be honoring the legacy of the Torres Brothers next year in a full tribute to lucha libre and Hispanic wrestlers(dating back to the early 30’s). In Los Angeles where he was a true wrestling god(sorry, but JBL’s inane claim is pretty hollow) in the 50’s and 60’s, he held various world tag title versions plus the single world title there under the watchful eyes of promoting/booking legend Jules Strongbow, Charlie Moto and Sandor Szabo. In 6 man world tag title belt defenses with his hermanos, they had no peer. When the trio later battled the Vachons and Assassins in Georgia in the 60’s(Maurice, Paul and Stan Pulaski) it was pure gate magic selling out the Omni and other venues for several years and ranks up there with Blassie-Tolos, Sammartino-Kowalski and Sheik-Brazil as one of the all time great/lengthy feuds in the biz. Retiring in Calgary was an odd choice but Enrique enjoyed the cold weather as a contrast to the warm weather he’d experienced in climes most of his life. He was still training and coaching future wrestling stars almost to the time of his passing. He’d also made several early 60’s tours for Rikidozan after Thesz, Blassie, Beyer and the Sharpe Brothers had made history there.